Mostly specks,reds,flounders but sometimes get invited on offshore fishing trips for tuna/wahoo/etc. Got e-mail from John C,thanks for heads up,dat Spillway Opening may occur as early as next week,the 27th to be exact.Guess ya gotta do whatcha gotta do,only consolation is opening this early may allow decent speck fishing maybe by June,July,obviously critically dependent upon how many bays,how long opened,etc!! !Crawfishing might be best option til Lady P gets right,yet again!!! Wifey,older son,grandson,and I hit Middendorf's yesterday for pre-Valentine's day feast and we not only enjoyed our meal,we also had fun checking out their little wildlife zoo behind the restaurant.Had some time on my hands,the weather looked like it was gonna cooperate and I hit one of my favorite Honey Island Swamp tree rat spots,armed with my older son's sniper rifle,Ruger lever-action .22 magnum and he loaded up a few ballistic tip bullets as well as hollow-points.Was really hoping to snipe a hog but guess my luck eventually had to run out,especially since today I was armed and dangerous!! !Only had one tree rat jump from tree to tree,finally stop,put him in cross-hairs and fire and heard solid thunk and thought he might get stuck in tree but he fell forward and landed upside down and DOA!! !Did quite a bit of stalking,saw another hunter and we quietly waved and each went separate ways and I made my way to end of long trail where I spotted flock of woodies just yesterday but none today.Slowly made my way back towards vehicle,ran into another hunter,this time we chatted briefly and turns out he lives in nearby Nicholson.He decided to make his way out,I hit another spot and was slowly walking a slough and doggone tree rat high-tailed it and hard to scope a running tree rat!! !Ended up with just one and did not see single hog,guess hunting pressure has them more than nocturnal and this is first time in quite a while that I did not spook one or even hear one! !Got few more days and with scoped .22 mag rifle,hogs better be on guard!!! Had decent weather and nice window of opportunity and took Medicare Client back to Honey Island Swamp,hopefully for nice little redemption tree rat trip(yesterday was total wash-out,not unexpectedly)and only managed one decent tree rat(saw at least 6 but most were running on ground)and hate shooting tree rats on ground,mostly for safety reasons(never know if hunter may be just ahead of ya)and we did spook small family of perfect-sized hogs,probably each about 100 lbs!! !Saw fresh hog droppings and saw clear signs of rooting up acorns,grubs,worms,etc and need to redeem self on nice grilling-sized hog!! !Did see very fine flock of woodies on slough and they got wind of me wanting to take awesome pic of them and took off before I could shoot pic.With the miserably weak duck season a lot of us endured this past season,kinda hard not to want to target the numerous and fantastic-eating woodies we have routinely seen(every trip have seen minimum of 20 woodies)!! !Might take ole Southfork out tomorrow,sight-casting for reds,weather and tides depending!! !Kinda hard to not wanna head back to Honey Island,especially mid-week!! !Those woods fulla perfect eating-sized pigs and might tag along .22 magnum rifle!! Got ole Southfork back from Chuck Evans(he took her to MS to a friend of his-got her screaming)and had window of opportunity,wanted to make first-light launch but foggy conditions put a damper on dat and waited til about 7:15 am to launch and was checking out the ole 50 Johnson and got her roaring,slowed down just before a curve in bayou(thankfully)and apologized to couple in fine canoe as I did toss a decent,though manageable wake and told em I was on search for grass-bed reds and bass and whatever else ole Lady P wanted to toss my way.Greeted with very expected foggy conditions but not so bad that using common sense and good compass and slow speed could not handle(have not yet installed new Lowrance GPS/Depthfinder)and about the time the foggy conditions were improving,made my way to protected cove,tossed Yum Swim n Dingers,got one tiny bass to attack just about the time someone'Unkown' on my cell phone tried in vain to get me to answer.Never will understand logic of blocking ya identity,like I am gonna answer dat call!! !Gimme a break!! !Tossed Yum Swim n Dinger length of protected cove,made my way back to Lake and was greeted with awesome Bomber Spinner Bait conditions.Saw handful of small and large alligator gars,never a bad sign as they and reds inhale mullets and was tossing Bomber when I felt significant tug,initially thought it to be huge gator gar,looked down at huge bull red,all of 30 plus inches with head like 16 lb bowling ball and he made one real nice drag-screaming run(doubted seriously that I would get this beast in as I musta tightened drag on last spinner bait trip)and felt line go slack and line broke at the damn knot!! !At least I had em for all of about twenty seconds.Did see quite a few fine reds,had two airboat jockeys cruise by me,between my starboard side and the fine shorelines and they entered a nice trenasse,perhaps they work for the Prieto family,not exactly sure what an airboat was doing in Big Branch Marsh.Figured,quite correctly,that their boat would spook reds and somewhat predictably,spotted at least 5-7 fine reds not far from where they entered Marsh!! !Made my way to Causeway,nada after all of about 20 minutes,headed back to where I had seen airboat,water was no where near as pristine and made my way homeward!! !Gonna check out T-Funky this Sat and saw enough reds to excite me,problem gonna be low temps and cold front but bet after a few warming trends,sight-casting reds time!!! Had nice window of opportunity,seized it,chased some Honey Island tree rats today and it certainly was spooky early this am with dense fog(hit favorite slough but waited under huge oak til daylight plus slight lifting of fog).Could hear owls hooting up a storm and mimicked a few and had pair of owls respond to my mouth-calling(getting practice for turkey season-easy to imitate hoot of owls)and joked with a buddy via text that these owls getting ready to swoop down and attack me! !Finally got chance to stalk tree rats and only had great shot at one,on tree facing down,easy shot and one round of 2.75 #4 lead and this fine rat DOA!! !Did shoot at one other tree rat but was long-range shot and not best shot to take.Spooked at least two big hogs,saw tons of woodies,think I am gonna forego regular duck season next duck season in favor of targeting plentiful and delectable woodies.Heck,with the limit being three and the amount of woodies I saw today,why waste my time chasing non-existent grey ducks and even more non-existent mallards! !Instead,think I will target teal in teal season,then hit fine spots in Honey Island once Regular Duck Season rolls around.Did run into group of hog hunters who lost pit bull to big boar and they had pretty yellow lab that had gotten gored but looked to be ok,minus serious limp.Guess I will never get it,hog hunting with dogs,seems way too dangerous,especially for the dogs that get gored on regular basis,according to Chuck Strain,the LAWLF Agent I saw on my way out.He did a courtesy check of my Hunting License and I joked with him about the time he was sent out to lend a hand to me and two buddies who had gotten stranded in a fine trenasse,draining the Big Branch Marsh and that particular day he made the comment that he did not now that trenasse existed and I jokingly advised him to keep it that way! !Also joked with him bout me turning 60 and no longer needing all dem pricey licence$ and he reminded me that for the wonderful,low price of $5,I could get all my licenses,except the Federal Duck Stamp!! !Can't wait!! !Hope Wifey and I get selected for Sherburne WMA Wild Turkey Lottery!! Wifey texted me this adorable pic of our soon-to-be-two year ole grandson,enjoying a nice bubble bath with three decoys,no rubber duckies for this lil gent!! !His dad and I used to hunt together and he got out of regular duck hunting with me and Katrina year we destroyed Big Branch ducks,mostly mallards,greys,teal,widgeons and a few trophy mottled ducks and rarely did we shoot scaup! !Love getting youth indoctrinated into my passion of duck hunting,just hope we get back to more of a normal migratory pattern before my grandson would lose interest from 'MT'skies!! !He and other much-older youths are obviously the future of duck hunting and with the miserable past few seasons,not sure our youth would stay focused!!! Came home from Friday Mass at St.Jane de Chantal and noticed my dogs(younger son's and ours)had destroyed nice pic of fine Causeway haul from way back in 2007,believe it or not,and pieced pic back together and remember trip like it just happened yesterday.As I recall,my depthfinder was accidentally set on beep mode for fish ID and doggone thing was sounding like a Geiger counter and I stopped alongside particular Causeway span,tossed perhaps the single most effective soft plastic lure out there(Fin-S fish,dipped tails in Chartreuse Spike-It-need to go back to that venerable and incredibly effective lure)and started hauling in fine white trout,perhaps some close to 3 lbs(pic attached)and also hauled in some luker croakers and think the whites ran off specks and remember showing pic to a buddy and he thought the fish were largemouth bass,believe it or not!! !Here's hoping for more trips like this one and gotta believe that there should be some fine fish at the Big Bridge sometime soon and on all my duck trips out in Lake,always sample water and salinity way up there!! !Sight-casting reds not too far away,especially with miserable at best,duck season!!! De Nuck and Futz Duck Bustas added Buddy to today's trip and used intelligence gleaned from yesterday's hunt to dictate where to go and paid off,though shoulda been much better hunt,had Buddy and I cashed in on gift flock of greys that shoulda been decimated,failed to drop one.Highlight of trip,besides relatively short paddle to killing blind,compliments of higher-than-typical water levels,was real gift set of two huge greenheads that had no idea we were hunkered down in extremely fine Roseau blind(saw ducks pitching down in pond with Roseau stand in perfect spot on yesterday's hunt)and saw enough to guide next few hunts,though getting to sweet spot takes some effort.Guess with the few ducks and in no way concentrated,pays to spend time paying close attention to not only where ducks emerge at first light but also where they work during shooting hours and set up accordingly.These greenheads decoyed like fools and my personal opinion is the flocked-head Highdon Magnum mallards looked way too realistic for these ducks to resist.Only wished we woulda broken down more cane to allow much greater visibility for us as greys surprised us and had we waited em out,they mighta decoyed just as nicely as the mallards did.Oh,well,not bad way to wrap up extremely frustrating and disappointing First Split.Might scout Joyce WMA for back-up and hunting partner for today used to shoot plenty of woodies in Joyce many moons ago!!! After looking at decent radar pic early this am,de Nuck and Futz Duck Bustas decided dey needed some dat duck bustin' therapy and we each managed two ducks,he got beautiful drake mottled duck and equally impressive drake grey.I am kicking myself for not opening up on 4 mallards that were a tad high but very possible,just do not like sky-busting and these mallards were up there just a tad.I did get burned by fine drake green wing,somewhat redeemed self with hen green wing and later had missiles headed my way,in the form of pair of scaup and took three quick shots,downed one missile and had to put another shell in duck to finish it.Have Abita KC buddy joining me tomorrow and taking his fine 18 60 G3 with 90 Yammie on rear,should get us on de spot sponto,as long as fog aint too bad.Gonna hunt just tad W of where I hunted today and saw fair number of woodies,one flock had greenhead mixed in with them and he wanted no part of my spread.They wanted down in another pond and I aint about to question why just gonna go where,makes perfect sense to me! !Hope to wrap up very disappointing First Split strong,at least I will bust it to get to dem wary ducks!!! With Ole Southfork getting new upper carb done,the Nuck and Futz duckbusters decided a paddle-in hunt to an ole stand-by was in the cards and Futz musta dealt himself a rotten hand as not much wanted to work area and Nuck was on de proverbial'X' big-time and he got his 6 while Futz struggled mightily to get two and we emerged with 8 nice greys,got a drenching-waterproof jackets and insulated waders made de trip easy and our paddle was a great aerobic work-out.Not sure where we gonna hunt Wed/Th kinda depends upon when Southfork ready to pick up and get her back in de game! !Did not see much of anything,save for some teal rockets early and smattering of greys! !Hope springs eternal and hoping greys show up as difficult to fool mottled ducks,mallards do work and woodies sometimes cooperate!Hope other hunters managed a few and love mid-week hunts,nice to not have inordinate amount of hunting pressure,though having hunters spaced strategically helps keep wary ducks from rafting up!! Unfortunately,de ole Southfork still not up to par,even with new set of plugs and chatted with boat mechanic,Chuck Evans,and think she gonna need new upper carb,no big deal since she is such a beast when running right and we had to putt putt to our hunt location this am,had an Abita KC buddy following us and he had his grandson with him,not sure how they did.Me and a dear Medicare Client went one way,Bayoubob another and we set up on tiny island(they are killer,especially for wary ducks like black ducks and mottled ducks)and I had just told my hunting partner to get prepared for some fine and tasty mottled ducks and sure enough,we had beauty of a pair come in,two shots,one from each of us,dispatched fine and big pair of mature mottled ducks(they had absolutely no idea where we were hidden,we were that well-camo'd up with about 20 giant palmettos) and I burrowed out the marsh grass so the 2-man Chapman would sit as low as possible.Saw very few ducks today,not sure where we gonna head tomorrow and luck of all luck,got flat tire on way home and Bayoubob took me to Wal Mart first(spare rim was bent and tire not looking too good)and all they had was white painted rim,opted to head to Academy,got galvanized 4-spoke rim and now de ole Southfork got new shoe on driver side,think passenger side feeling tad neglected!! !Did see some birds working specific areas,gonna head in general direction tomorrow-Happy Turkey Day to all and me and Medicare Client have fat mottled ducks to clean and prepare!! !Attaching pic of incredible blind,gotta be stealth to fool mottled ducks!!! P.S.Thanks,St.Nick for generous contribution towards new tire and rim!! Mandevillian,never growing tired of relatively MT Skies!Dem ducks know where de feed is and so do I!! Got a few reports from buddies that hunted different spots in Coastal Zone-two from the Delacroix area and one from Venice and all three were excellent reports with one lucky hunter getting their limits by 6:30(not sure if all teal or mixture)and a Venice hunter reported 2 shy of a 5-man limit and another Delacroix/Hopedale hunter getting mosty greys.I fished/scouted with a Medicare client and only managed a fine,though rat red,had four spots-two on each side,and we saw very few ducks,mostly bluewing teal and heard zero shots for the Sat Youth Hunt,not great news for the East Zone Opener next Sat! !Hope folks that had their Opener yesterday fared fine,can't wait for our Opener next Sat!!! 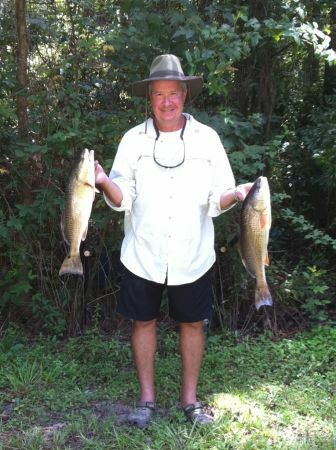 Thewizard7,Thanks and my fishing buddy was blessed yesterday(I shoulda blessed guide for about knocking us into marsh with big azz wake)and he sent me fine azz enhanced pic I took of him with the three fine reds he took home(his portion of box shot)!! !Many,many moons ago,I fished with perhaps the best soft-plastic fisherman on dis Planet and this gent was my fishing mentor(never did beat him in any of the tourneys we fished together in)! !He knew Delly-Croix at least as good,if not better than guides and he showed me some bodacious spots where he NEVER saw another fishermen,ever,and my game plan is to learn the intricacies of Delly before too long!! !I know ya gotta give out some spots to trusted folks but I only show spots to folks fishing with me and their understanding is to guard dem spots closely and that is precisely the reason I totally abandoned another similar outdoors-related site(two morons gave exact GPS coordinates of spot I routinely mopped up on specks,reds,flounders,bass and lagniappe crabs)!! !John C and I might see ya fishing some spots real soon-bet the April Full Moon great time for some heart-rushing Top-Dog action!! !Think me and Abita KC buddies gonna sight-cast some Lady P reds next week-hard to beat as we live so dang close to the launches and awesome shoreline spots!!! Mandevillian,intent on un-locking Delly-Croix's treasures!!! A comment titled: Re: Lottery Selection-Sherburne WMA! in response to a report titled: Lottery Selection-Sherburne WMA! Totally agree that something needs to be done about not only the lack of turkeys in Sherburne WMA but also the feral pig population.According to the regs,I should be able to blast a pig or two as WMA's allow feral hog hunts with the same weapons used for whatever season underway at same time and turkey shot should do a number on a pig,at close range.My understanding is that Sherburne WMA was one of the WMA's that had helicopter hog hunting(only LAWLF allowed to participate)and not sure how successful they were and that was at least two-three seasons back.The way I look at it is Wifey and I enjoy being out there and spotting,hearing,spooking a gobbler lagniappe.We intend to fish as well and many years ago,I was fortunate enough to bag a banded jake that weighed about 12 lbs and had a beard almost 3 inches long!! !Perhaps LAWLF can set up hog traps like the one I spotted just last week in Pearl River WMA.I attended last week's Public Opinion Meeting at Ponchatoula High and it does appear that LAWLF gonna shorten by one day the Wild Turkey Season in Sherburne but think that will occur next season.Thank God they listened to public opinion and did NOT reduce teal limits from 6-4! !Pays to voice opposition!! Mandevillian P.S. Why can't the LAWLF release some wild turkeys out there as I know they band them!! A comment titled: Re: Possible Bonnet Carre' Spillway Opening!!! in response to a report titled: Possible Bonnet Carre' Spillway Opening!!! John C,One of the more recent Spillway Openings I had a chance to attend a fishing seminar and Ashley Ferguson with LAWLF and Capt Mike Gallo were in attendance and they both advised that the denser,salty water was localized at the bottom of the Causeway(scuba divers reported a fine 'tunnel' of clear,salty water)and the trollers were still nabbing some fine specks and few reds and think they even caught a few flounders.Definitely shuts down the jigging style of fishing,unless ya locate 'pockets' of denser,salty water.Getting ready to install new Lowrance DepthFinder/GPS unit with TripleScan and be interesting to see what Side Scan at Causeway shows-bet pockets of big ole specks hugging de bottom.Looking forward to getting together with ya this Wed to pick up dat new Quantum Smoke spinning reel. Drake870,Lady P is indeed a resilient ole Lady and catching fine blue catfish in addition to some fine reds not necessarily a bad thing,algal blooms are another thing entirely and opening it early like this may mitigate the damages and introducing plenty of forage for crabs not a bad thing as well.It does hurt the speck fishing in the short-term but typically Lady P rebounds quickly! !My 0.02 for what dat is worth!!! lanco1,Not sure if it was the second-to-last opening or last opening but I am sure in both scenarios,I was still catching fine reds fishing along the grassy shorelines,at the time tossing chartreuse Berkley Gulp and I was nabbing some fine blue cats and a few reds at the Causeway pilings.There were a few trollers nabbing some specks,presumably those hanging around in the lower,high-salinity water at the bottom.I hate using market bait as I usually only attract trash fish with that,like stingrays and hardhead catfish with a few gafftops thrown in!! !Bet there will be pockets of clear,higher salinity water along the NShore,like every Spillway Opening!! Guys,Josh and I spoke today,not to the degree that we usually do and had been doing and I went to the website,watched the videos and gotta lotta momentum going forward and gonna be hard to stop the momentum he has generated! !All in for his organization and hard to ignore what he has gotten,lotta facts,facts,more facts,not opinions but data and facts!! !Hard to ignore the back-to-back miserable seasons most of LA endured and even harder when you realize he has probably over 20 years of weather data and guess what,worst winters did not equate to best duck seasons,anyone wanna venture a guess why?? ?Again,he and I know that you can't run from facts and he has many more items ready for release,just wait to see what transpires!! !Kinda reminds me of Fox 8 Investigative Reporter Lee Zurik exposing plenty of faults in Health Insurance-got ole United Health Care caught with plenty of blame regarding 'claw-backs' where poor consumers were getting tattooed paying way more for prescription drugs than what was warranted!!!! !Love stirring de pot!!!!! fowlhooked,The mention is of grain OR other feed that has been distributed and no mention is made specifically of sunflowers or sunflower seeds.Too bad ole Harry Lee aint around to explain what happened to him and bunch of folks that apparently got nabbed for dove hunting a field that had been 'baited',even though they claimed no knowledge of it.To be perfectly clear,it is incumbent upon the ethical hunter to inspect those fields to make absolutely certain no seeds or grain has been dispersed,whether intentionally or not.One of the key words is 'normal agricultural operation'.Now here comes the definition of NORMAL AGRICULTURAL OPERATION(Caps from Hunting Regs).A normal agricultural planting,harvesting,post-harvest manipulation,or agricultural practice that is conducted in accordance with official recommendations of State Extension Specialists of the Cooperative Extension Service of the USDA.Read those regs carefully! !Might just need a good lawyer to interpret them! !